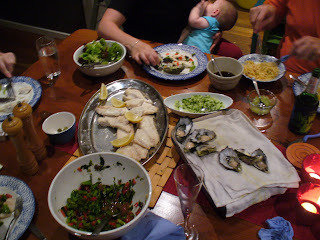 One of the other dishes on offer at our dinner for the Ds were freshly shucked oysters. Chef came home with a bag of FIVE dozen unopened oysters and a shucking knife. I had seen this recipe in the December/January08 edition of Vogue Entertaining and it really appealed. It was indeed a taste sensation – … Continue reading "Oysters with soy, cucumber, chives and lime dressing"